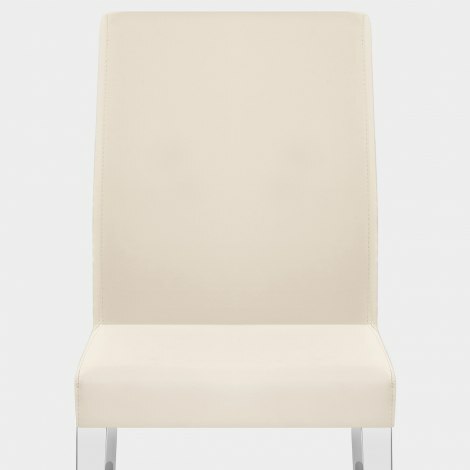 Classy and contemporary, the Dash Dining Chair Cream is a marvellously modern model with a cool, crisp look that is sure to succeed. Enhancing your home with its understated style, the Dash is the perfect choice if you are looking for sleek simplicity. Upholstered in sumptuous cream faux leather, the stylish seat and supportive high backrest are padded for comfort, enticing you to sit for longer stretches of time. Set on a sleek chrome frame, its glossy reflective surface mirrors its surroundings for a minimalistic appearance. With four sturdy legs that taper to the floor, their chic rectangular shape is an attractive addition. Completed by protective pads to help minimise the chance of marking to floors, the Dash is too good to miss. "Great product. They look great and are comfortable"
Excellent quality with a one day delivery . Well made strong and good price. Fast delivery, excellent service. It's the second chair I've bought from Atlantic and once again I'm really pleased. The quality is great - I wanted shiny chrome legs and a cream, padded seat and it's really thick and comfortable. It is a true cream - like buttermilk - not ivory or off white. These things often need to be assembled, but of course it came in one piece as it is padded all over. Very happy!! This is the second time I've purchased from Atlantic Shopping and will again. The service is first class, the items are as described and good value. The website and buying process are easy. Highly recommend. Love these chairs. Very sturdy and goes well with my white gloss chairs, excellent value for money. Service and delivery good. Will definitely buy from Atlantic again.